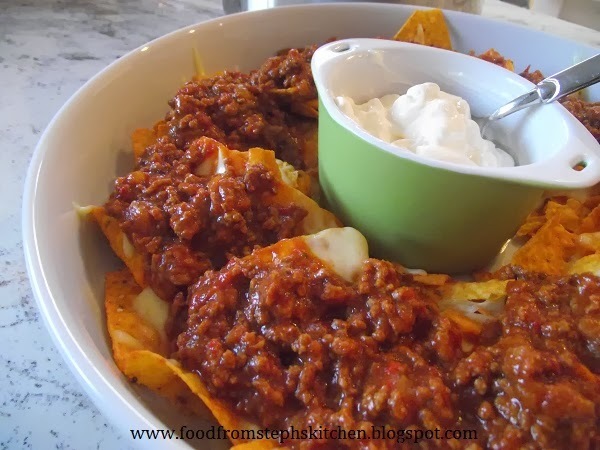 I've been making chilli mince for many years now, and it's slowly been adapting into what it is today. 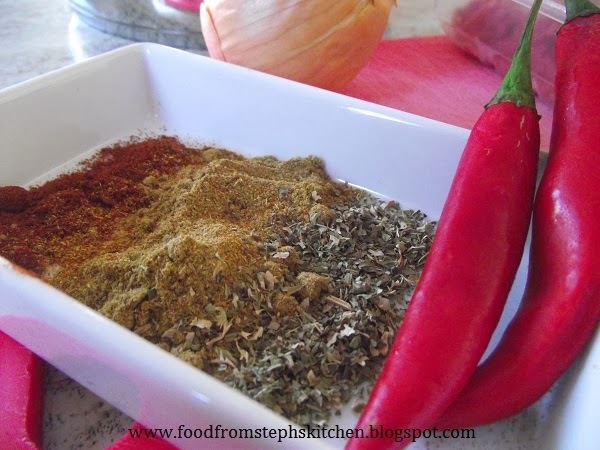 Even a year ago (when I first posted this recipe on my blog) it was slightly different. But the recipe I have now is spot on! It has to be the best chilli I have made over the years; even Mr Steph agreed. I used to simply use a can of tomatoes and some tomato paste. The one day Mr Steph said "Why don't you use soup like you do in your bolognese?" as he just loves my spaghetti bolognese meat sauce. So I thought I'd give it a go, and it created the best mince that I ever made. And now I share this recipe with you, so that your family can love it just as much as mine. The mince isn't a hot chilli that makes you run for milk, and if you are a chilli lover you'll be happy that it does still have a bit of bite that you'll be happy with. I know you might be thinking 'Oh, you are just saying that! ', but Mr Steph is a MASSIVE chilli fan. He is the extra hot peri-peri guy at Nandos. So when I say Mr Steph doesn't say it's mild, then you know it has a bit of a bite. As he is the chilli lover and not me I have also asked him to give it a chilli rating out of five. I get Mr Steph to give the rating for any chilli dishes as for me anything other than mild is "hot", and he thinks my rating isn't really accurate for chilli lovers. Firstly measure out your herbs and spices into a little dish, and dice your onion and chilli. If the kids aren't a big fan of hot food I would only do one chilli and skip the cayenne pepper in the recipe. In a large pot or frying pan heat up your oil over a medium to high heat. Add in your onion and chilli, cooking until the onion becomes transparent. Next brown your mince, making sure it gets a little bit of colour before you add in your herbs and garlic. Allow them to cook off for a couple of minutes before adding in the tomatoes and soup. Now this part really depends on how long you want to cook the mince for. If you have the time to cook the mince for the full time (1 1/2 - 2 hours) then grab one of your empty cans and fill it up with water half way, adding this into your mince. If you don't have that time available see my notes below for the quick, cheat's version. You cook the mince just that little bit longer for burritos, tortillas and tacos as you want it to be thick so that it isn't too "soupy". 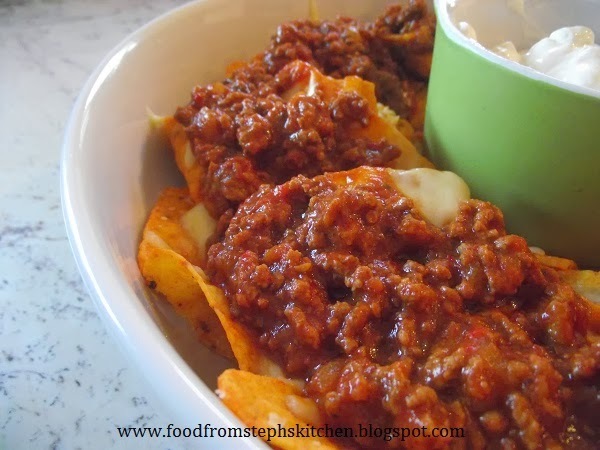 I find it being a little more like a bolognese is good for nachos. Serve with corn chips, tortillas (or try my easy home made tortillas) or tacos, along with your favourite trimmings. For us it's sour cream and cheese for nachos; tomato, cheese, pineapple, lettuce and onion for tortillas. Note: If you need the chilli on the table as quick as possible, simply add in half of the soup and cook it for 30-40 mins as normal. It might not have the full flavour, but it tastes just as good. I often do the quick version during the week as I just don't have the time to cook it for longer.